Although I have more of a management role these days I am still very much involved in designing and building digital products. And I still like that a lot. When you call yourself a “creative” person it is hard to just stop creating. Design or digital design is quite different today than it was a few years ago. The tools changed. What was Fireworks became Photoshop, what was Photoshop became Sketch, what was Sketch became Figma and Figma might become Invision Studio or Webflow or whatever. With the tools the design languages also evolved. From “Bevel an Emboss” we moved to flat design and all of a sudden every website looked the same. I wonder if someone counted the amount of copies people created from the stripe.com website. I read a post from Claudio Guglieri recently which made me think about how I start designing e.g. a website. We as designers put to much trust in the tool we use every day. Especially when you’re in web design, you look at a bunch of inspiration sites and start designing. I am designing websites in Sketch most of the time — I like the way symbols work in Sketch and it is a good feeling when everything is structured nicely, you have your symbols, text styles and sort of design components. But, the tool totally limits your creativity. We become so obsessed with the tools we use, because every designer has a favorite and tries to convnice other designers to use the same. And that’s just so wrong. Instead why not starting with an idea first. And with that I don’t mean to start looking through the archives on siteinspire.com or awwwards.com or whatever. I mean we should maybe just grab a nice design book or we just go outside and look around or we just look at old interface trends. Sometimes I find that some interfaces from 10 years ago worked better, than the stuff we are creating today. As an example — when you create an interface for a country where the internet just became a thing three to five years ago, “Bevel an Emboss” is still worth using because no one understands the flat design trend yet. Also a few words on the topic storytelling (however you interpret the buzzword). When you want to tell a story, meaning want to sell a product it is first of all irrelevant to look at interface design trends. We (as designers) should focus on the idea first. What’s the product about, in which surrounding can we put it so that people find it interesting all of a sudden. I just started reading a book on the topic NLP (Neuro-linguistic programming) and although I just read 30 pages I already got so much inspiration out of it, how I could make ideas work better. I highly recommend looking into that topic! Well, my point is, there is so much work to be done before you even start drawing or designing something and with the recent design trends we got just lazy and put something out there without focusing on the why, how and what anymore. With the flat design trend everyone can be a designer today. With the flat design trend everyone can be a designer today. You don’t need to learn a bunch of tools in order to design a website. Just use sketch, put some rectangles with rounded corners on the artboard and the job is done. I know that sounds harsh but with the flat design trend lots of young designers lost their curiosity for trying out new tools and things. 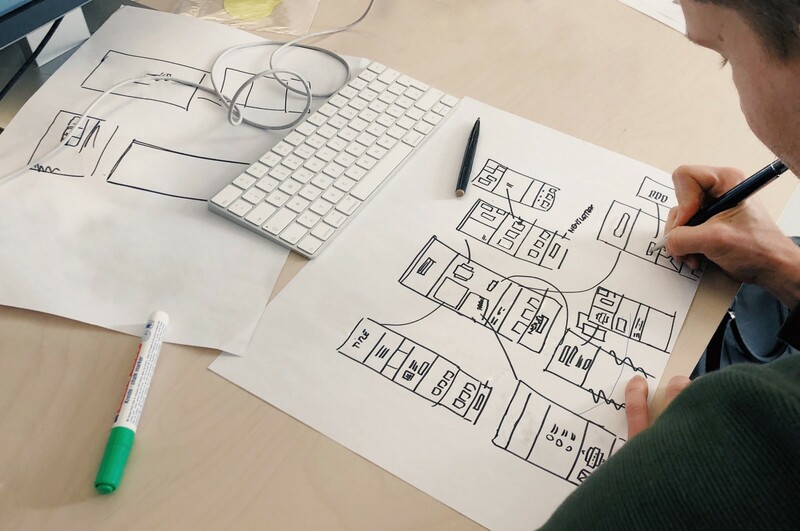 By only trusting Sketch as the one and only tool, designers limit their creativity because Sketch doesn’t really allow to create designs with more depth or more detail. When we start focusing on the idea first, we can let go of the tools we are used to create with. Sketch is just limiting your ideas. Sketch can’t do things you can do in Photoshop. I like Sketch for its easier workflow when it comes to web design, but the first step should not happen inside the tool. Just start sketching an idea with pen and paper and then think about which tool might work best to digitalize it. This is hard, because it is likely that you have to learn how to work with a different tool now — but this is good as it lets you visualize even more ideas and create richer designs than before. It is also good for your brain to learn something new from time to time (duh!) and it just makes you a better designer. With web development the Zeitgeist is a little bit different. Every day you can learn a new thing. When I started with building websites around 15 years ago all I needed to know was a little bit HTML and CSS. I developed designs in tables — crazy. I used inline styles (which is more and more popular again). It was fun to develop a website. You just wrote a few lines of code and you saw something in your browser. When I start building a website now I have the feeling that I need around two days for constructing the setup for it. I have to install something like nodejs, grunt, gulp, sass or whatever to just start writing code. While SASS made a few things easier in web development it sure as hell scared a bunch of designers who wanted to learn to code away. When you need a day or two to just start coding something, the fun is gone. Developers have to learn so many concepts, frameworks and languages these days, it is crazy. I read Frank Chimero’s post “Everything easy is hard again” recently and was basically nodding the whole time. To sum up — focusing on one tool to design something limits your creativity. When it comes to development, focusing on twenty tools might scare you to even start writing down an idea in code. In the end it’s all about creating something of value, something with a purpose. And to do that, you should never focus too much on the tool you’re used to. In development, if you find all these frameworks and languages overwhelming start with the basics. The user cannot tell whether you used Gulp or Grunt to build a website or if it was just a totally lame HTML file. I feel I really lost something over the last years by focusing too much on the tools I was using and I am looking forward to find that something again. Just do it! This post has originally been published on my website.